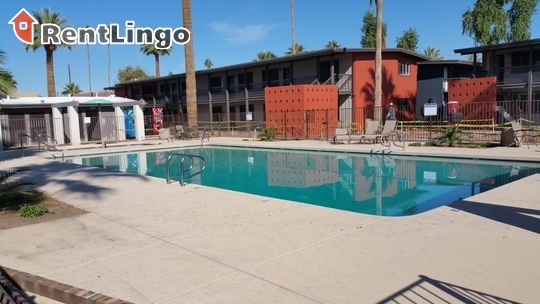 This older two-story brick complex that will soon offer all new remodeled apartments and a great location with welcoming garden seating areas with fire pits. 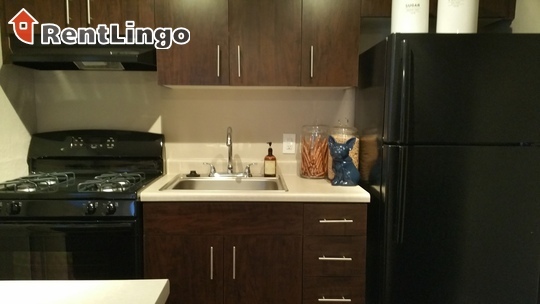 Kitchens are small and well laid out but there is no dishwasher included. 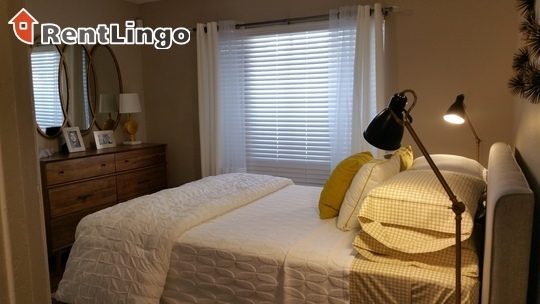 Walkable to local amenities such as Starbucks or Gadzooks Enchiladas and Soup. Pros include: There are garden seating areas with fire pits planned. A new community room will feature a billiards table. The pool and children's pool is also set to be remodeled. There's community W-Fi available at the pool area. Good storage in the kitchen. On the down side, there are no elevators for the second floor apartments. 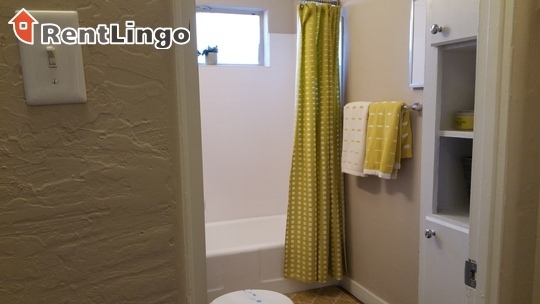 None of the two or three bedroom apartments have two baths. There's no dishwasher in the kitchen. Across the street from Phoenix Country Club community, you're walking distance to local amenities and public transportation. Downtown Phoenix and the Camelback Corridor are minutes away. The complex is bordered by a quiet street on one side and a busier street along the far end of the complex facing 7th Street. This property in the the process of a full remodel. The grounds will have small garden groupings with fire pits, a community room with pool table and all new apartments featuring a bright, open floor plan. Some will even have balconies. 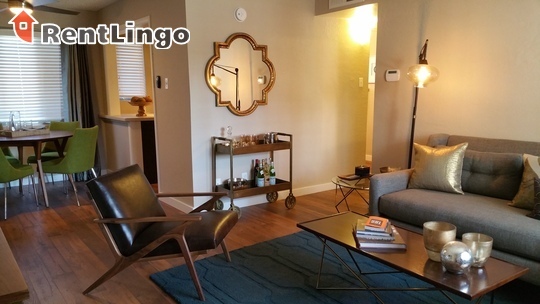 Club 7 Apartments is a 220-unit apartment complex featuring Studio to 3 Bed floorplans. Getting this apartment was easy and cheap. Moving in was a nightmare. The place had not been clean and wasn't ready for move in. Hair and dirt everywhere, animal poop and cigarettes on the patio. They never apologized but finally had cleaners come in after two days. Tons of things were broken and had to be fixed. We had two leaks in the apartment and they didn't come fix it until two days after we complained. We tried to wash all of the towels wasted trying to control the leak and the washers and dryers were broken and eating the money on our card. They never reimbursed us for our troubles. We went a day without water to apartment due to a water pipe breaking and currently we don't have hot water, it has been 24 hours. This place is awful. They spend more money making the apartments look "luxury" instead of spending money to make this place livable. And trying to communicate with management is impossible. THE LADIES IN THE OFFICE ARE GREAT AND SUPER FUN. THE PROPERTY IS OLD BUT YOU CAN TELL THEY HAVE DONE A LOT. GREAT DEAL COMPARED TO A LOT OF OTHER APARTMENTS NEAR BY. RESIDENTS HERE ARE SO FRIENDLY! SO HAPPY I WENT WITH CLUB 7! This apt office is run by low grade - un-professionals! The communication from this office is ridiculously misleading, hypocrite and messy. I WOULD NOT RENT FROM THEM! UTURN out of there before you get STUCK! Long story short: I looked & leased this @ this apt. When I went to get my unit# they gave me the wrong one and then emailed disregard and gave me right unit#. After this, I received a string of emails that did not make since because they said I didn't have a holding fee on unit. They gave my unit away and said that it was my fault. The employee did not tell me I needed a holding fee because I looked and leased that day and she even was ready to give me the keys if I had renters insurance in place. I received other emails not pertaining to me about how the complex was run. Some one had no heat, they referred to me as unit#chick & employee gave long apology to her coworker but not one person gave me a real apology. They did not offer me another unit. They still wanted a holding fee when I finished all my application signing. The manger was passive aggressive! They now won't give me back my application fee even though it was their paper work screw-up. The employee that did my paper work also knows she screwed up my paper work but blames me that she told me when she clearly didn't. The whole nightmare story is on yelp. I asked to talk to a higher up and no response. I sent email to headquarters of this management company, no response. I checked out the apartments here earlier this year, but never ended up moving in due to poor management and terrible communication. I was flexible about my move-in date, but I let them know the timeframe I preferred, and I gave them the $100 they require to hold a unit. Renovations were still being done on the buildings with the unit I wanted, so they didn't have an exact date, but they gave me an estimated timeframe, which got pushed back several times. As I mentioned, communication was terrible, and I had to call frequently to see if I had an official move-in date, a unit number, or a lease to sign. Finally I was told I could move in on either Friday or Saturday of a weekend at the end of June, but I had to call back several more times to find out which day was going to work for them, and again if there was a lease to sign. The woman I had been working with finally told me that I could move in on Saturday, and when I asked her again about the lease, she said I'd sign it on the move-in date. She gave no indication whatsoever that this date was an estimate. She was able to give me a unit number at that point, which I needed in order to purchase the renters' insurance policy they require. As unclear as communication had been, and as weird as it was to not have signed any paperwork yet, I put my trust in this woman's words. I called to verify what time I'd be able to get the keys and sign the lease. I went to the leasing office the morning of the move-in date, with all of my stuff ready to be moved in. I was met outside by the woman I'd been working with, who said she was going to call me, as the renovations had not been finished, and they needed more time. I was distraught, thinking I'd have to put off unloading my things until later in the day. After several minutes of talking and trying to understand why this hadn't been communicated with me, it was mentioned that maybe I'd be able to move in the following week. Maybe? Next week? How bad does management and communication have to be for a mixup like this to happen? I asked to speak to someone in charge and was told that the manager was not there, and ended up spending 45 minutes rehashing the events leading up to that day with the woman I'd been working with, along with another woman in the office. The woman I'd been working with denied any wrongdoing or miscommunication. The other woman had all the wrong information about my situation, which highlighted the office's awesome communication. They said I'd be able to move in 2 weeks from then, prompting me to ask for my deposit back. Of course there was nothing they could do, pointing out that I was the one backing out, so I'd be forfeiting my deposit. I called back to speak to a manager later in the week, and I do not trust that I actually spoke to a manager, but was told the same thing about the deposit. The place is horribly managed, communication is terrible, and they show no remorse in their wrongdoing. I can't imagine they're any better with actual tenants.